The bright green carpet, the colour of grass in cartoons, absorbs my footsteps. The hallway echoes with sounds from elsewhere in the building, a click of a door shutting, a scrap of a conversation. The scene around me is as perfectly still, as if I am walking through a photograph from the 1970s. 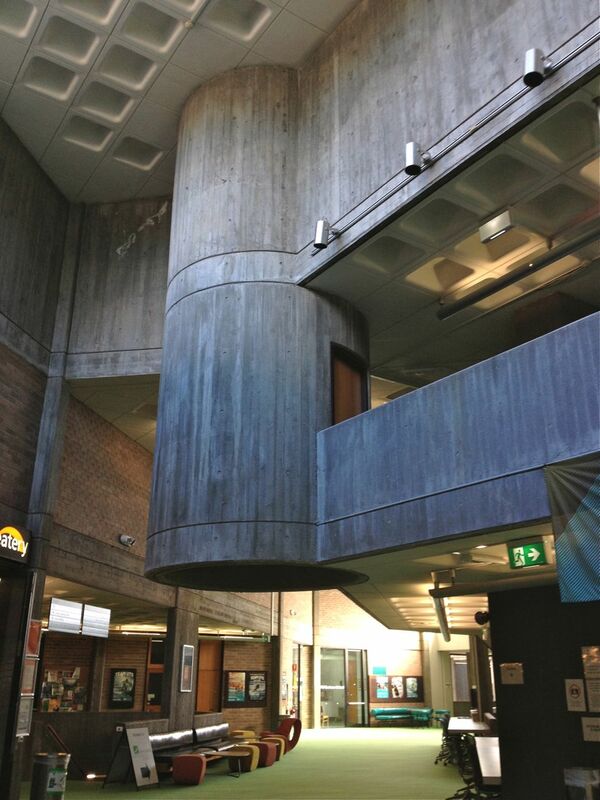 I’m moving through a cavernous space with towering beams and cylinders of concrete, inside the new William Balmain Teachers College, which opened in the Lindfield bushland in 1971. In truth it’s 2015 and it’s the end, rather than the beginning. 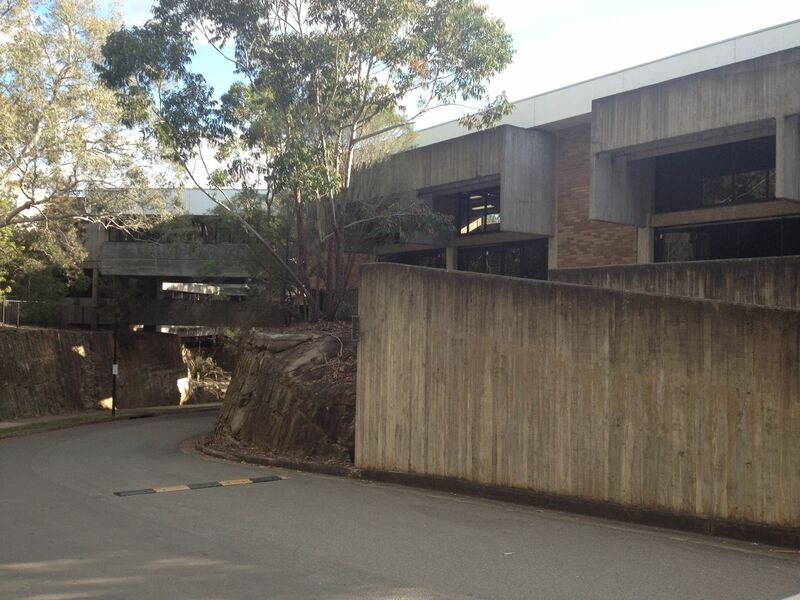 UTS, which inherited the college, has operated here since 1990, and has swapped this brutalist bushland enclave for a former TAFE building in Ultimo, and this campus is soon to close. When the teachers’ college opened in 1971, a Sydney Morning Herald article described how: “If it were in Japan or Italy architects would make a special point of visiting it. As it is just in the backblocks of Lindfield on Sydney’s North Shore, not many people will see it”. Backing onto the Lane Cove River bushland, at the end of the residential streets that trail down from the Pacific Highway, it is perhaps not a place one might expect to discover a brutalist fortress. 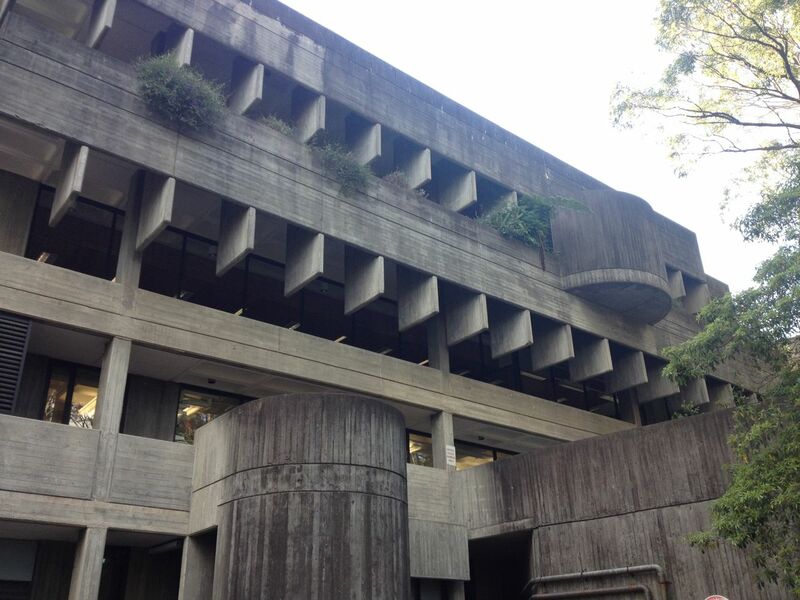 Designed by architect David Turner, it won the Sulman Medal in 1978, though it is only with the recent upsurge of interest in Brutalism, and the sale of the surrounding land for development, that it has come back into general awareness as an significant building. Constructed to complement its bushland setting, the campus is a five storey split level structure, a complex network of courtyards, bridges, spiral stairs and walkways. It’s part Italian hill-top village, part castle, constructed in raw concrete. Navigating it is negotiation a labyrinth of levels and stairwells, a game-like exploration through corridors, rooms and halls. I get used to its spacious stillness and following its hallways at random becomes an adventure. 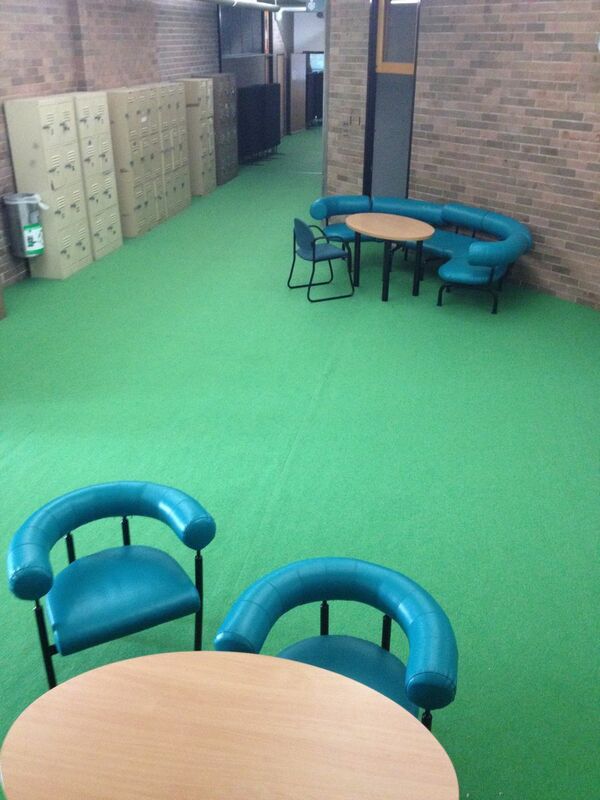 I count the 1970s fixtures, circles of aqua vinyl lounge chairs, bright orange spherical light fittings, pink railings. 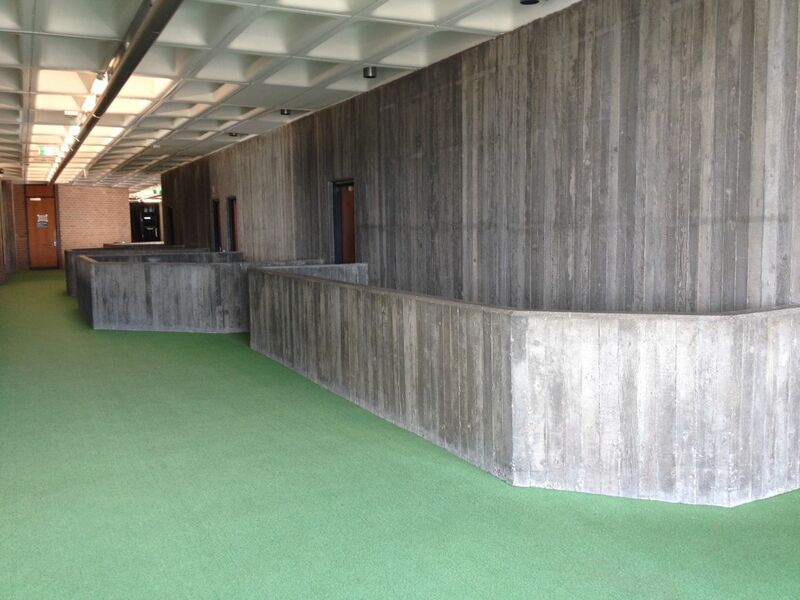 In the same 1971 article that described the college’s suburban location the green carpet is noted as a surprising feature: “it must have taken a brave man to select such a colour for a public building”, Eva Buhrich writes, going on to detail the “sweeping balaustrades” that “just for the heck of it, are finished with lolly pink handrails”. I pass a table of free books set out for people to take and stop to flip through education textbooks from the 1970s, with black and white photographs of children playing and sitting to attention in classrooms. The surrounding office doors are decorated with postcards and notes, but all are shut and there is no one in sight. I pass a pottery workshop with a row of glazed miniature heads, a window display of pottery deep sea fish, a display cabinet of counting apparatuses and a giant size slide ruler. In 1955, the English architectural critic Reyner Banham, in his writing on the “New Brutalism” described how: “what moves a New Brutalist is the thing itself, in its totality, and with all its overtones of human association”. There is indeed something very total about the Kuringai building. Unlike its northern suburbs Brutalist contemporary – Macquarie University in North Ryde – this building folds many within it, into one complex, united structure. The slabs and cylinders of raw concrete have a monolithic presence, and seem almost of the same stuff as the sandstone of the ridge on which the university was built. This merging was accentuated by the landscaping by Bruce Mackenzie, which preserved as much of the surrounding bushland as possible, and incorporated roof gardens and courtyards planted with paperbark trees. There isn’t much time to visit the campus as it is – the university semester is almost over, and farewell gatherings for past students have been planned for November, after which it will close. After the university leaves the building will be converted into Lindfield Learning Village public school, to open in 2017. In it’s proposal, although “many aspects of the building will be retained”, some “internal elements” will be assessed for their “appropriateness for a school”. I guess that means the bright green carpet’s days are numbered. There are plenty of archival photos of UTS Kuringai here, featuring 70s hair, knee socks, boxy computers and clunky AV equipment, and the campus in its heyday. UFO sightings in Sydney, while relatively frequent, are nonetheless fleeting. You have to be looking at the sky at just the right moment to notice the glowing orbs and mysterious shapes that sometimes appear above us. Some areas like the Northern Beaches are known UFO hot spots with a database of encounters to prove it. But there is no need to visit the Narrabeen Lakes and wait for the bright lights. Alien space craft exist among us on the ground. 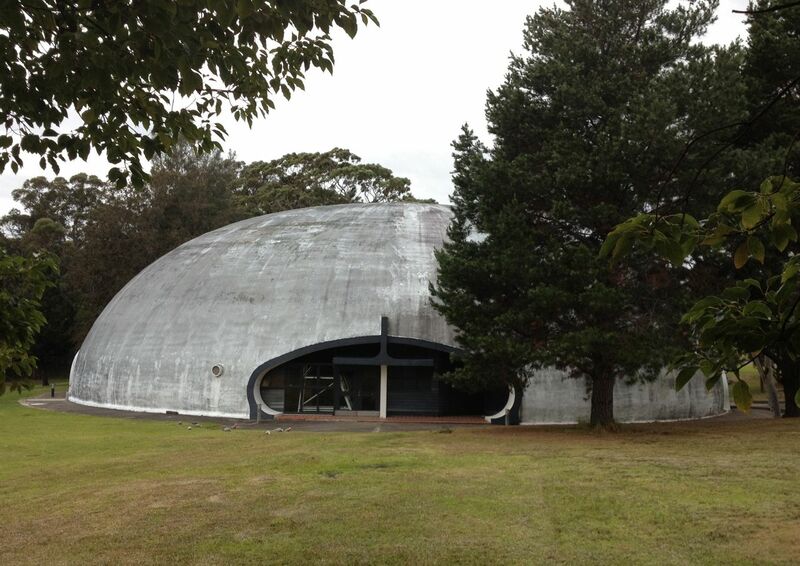 The bright lights and weird shapes seen over Narrabeen are perhaps attracted to the three spherical structures at the centre of the public school. 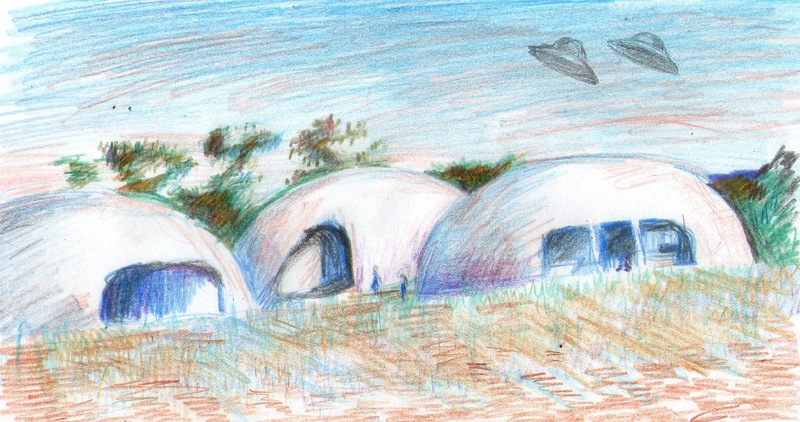 These are binishells, concrete domes constructed in the 1970s in a NSW government project which saw 14 of these curious buildings appear across the state. The structures were masterminded by the Italian architect Dante Bini. He developed a construction method where concrete was sprayed over a membrane which was then inflated to form a dome. 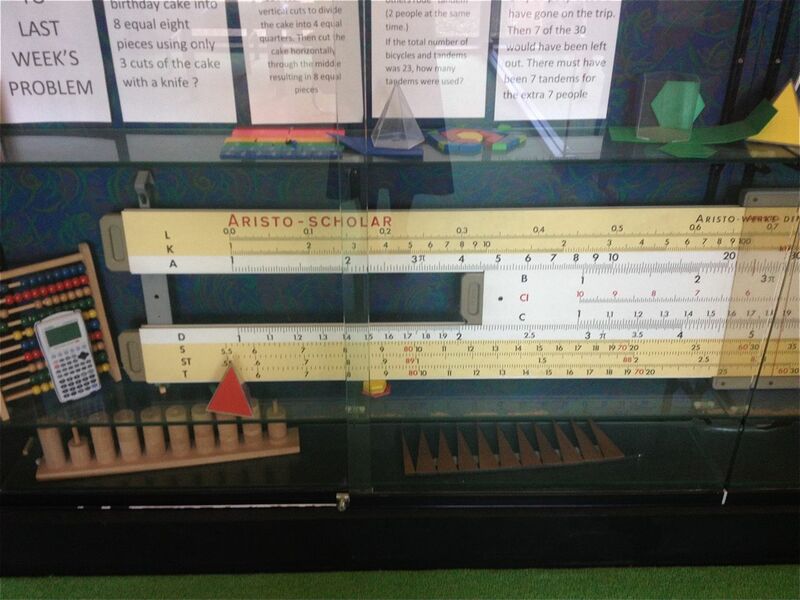 In the six years Bini spent in Sydney in the early 1970s numerous binishells were constructed in primary and high schools. Ashbury Public School Library. Photo by J Bar. 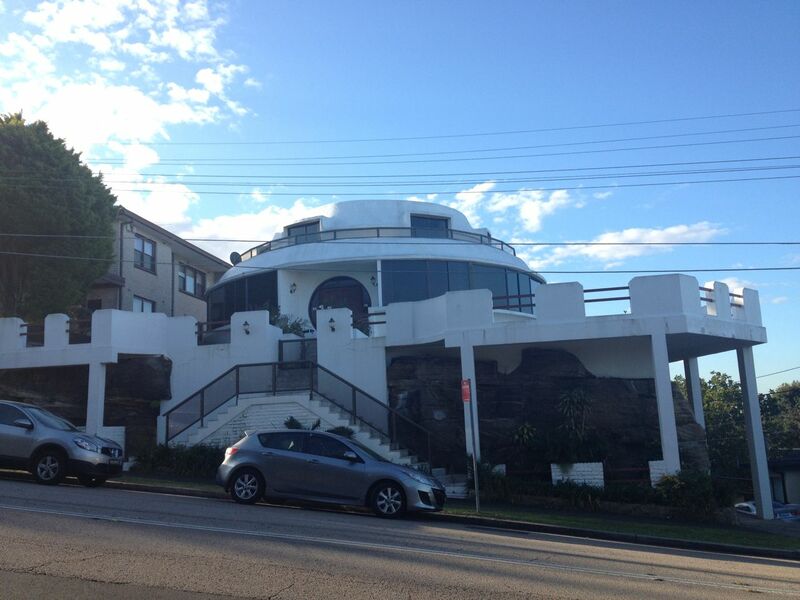 Sydney does have a number of space ship houses, however. The most notorious is familiar to anyone who drives north across the Spit Bridge. It perches on the steep hillside above Middle Harbour, its circular form bulging out in segments of tall windows. It has a kind of James Bond villian’s lair ambiance, bringing to mind images of lurid flared pantsuits, cocktails and the retro futurism of 60s style. The house was built in 1964 by architect Stan Symonds, known for his free form, sculptural designs. He is responsible for various unusual Northern Beaches houses, including the Pittwater house with the surprisingly phallic floorplan (its recent sale was a subeditors dream for headline puns) and the Seaforth Dome house (listed on Airbnb for the very curious). The Seaforth house visible from the Spit Bridge is known officially as Vendome, or the Schuchard House, although it’s known by many as the space ship house or the flying saucer house. 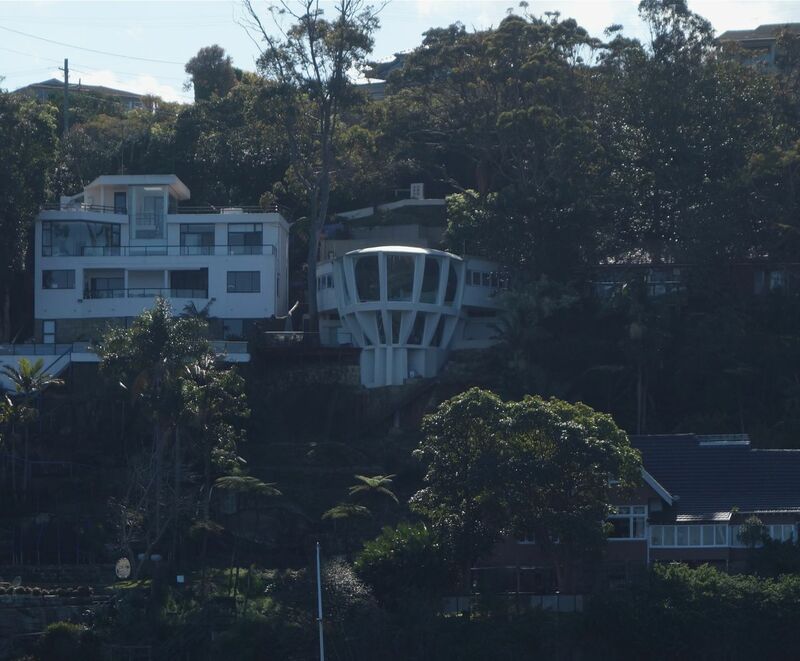 I walk along the pedestrian path of the Spit Bridge towards the space ship house. 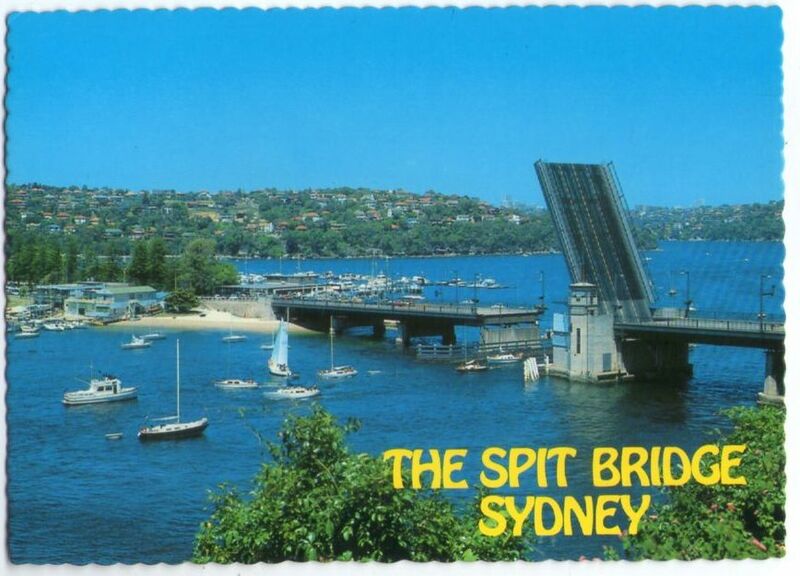 The Spit Bridge is not a particularly striking structure most of the time, except for the 5 or so times a day a section of it lifts up to allow ships to pass through. The part that moves is a central section of metal girders and mesh. It shudders under my feet as the traffic rushes over it and the metal booms and echoes. I endure this disconcerting experience as I stop to peer over at the space ship house. The room that bulges out is like a fishbowl and I can see the indistinct shapes of furniture inside it. Then a shape shifts and I realise there’s someone in there, wearing a red shirt, moving about. Feeling voyeuristic I drop my gaze and continue across the bridge, as men in suits and sunglasses drive by in convertibles, and buses pick up speed before tackling the hill up to Seaforth. The view from the top of the hill, the spaceship house’s wedding cake neighbour in the foreground. From the street there is little clue to the space ship below, besides the house’s curved roof. 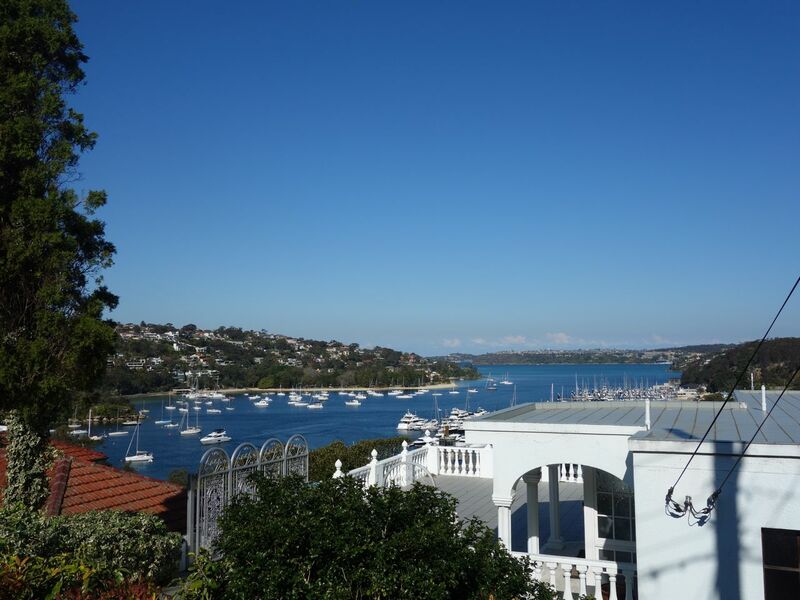 But from here I can see down across Middle Harbour with its clusters of white boats, and watch as the cars stop on either side of the bridge, the boom gate go down, and the centre slowly rises. The Earlwood Spaceship – thanks Earlwood Farm for directing me. and in Eschol Park near Cambelltown, the bizarre Mount Universe, the never finished headquarters for the Universal Power society. The structure, once visible from the surrounding suburbs but now obscured by trees, was based on Saturn’s rings. Construction began in the late 1970s but not completed, although the sign remains at the gates. 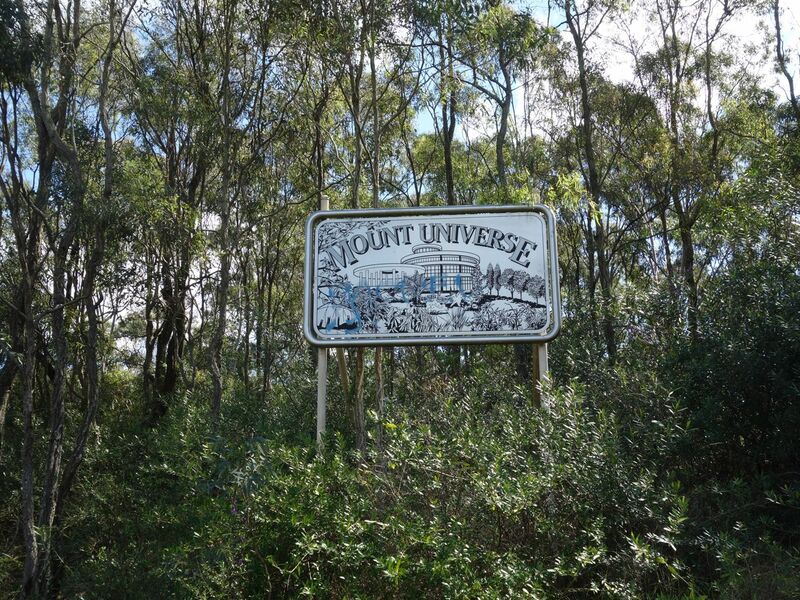 Mount Universe, Eschol Park, thanks Steven Savona for UFO spotting. The 1960s and 70s were the era of space ship buildings. They were no doubt influenced by the space age, but their other dominant influence was concrete. The adaptability of concrete as a building material enabled the construction of the binishells and the free form structure of the Shuchard House. But of all architectural styles there is none more celebratory of concrete than Brutalism. 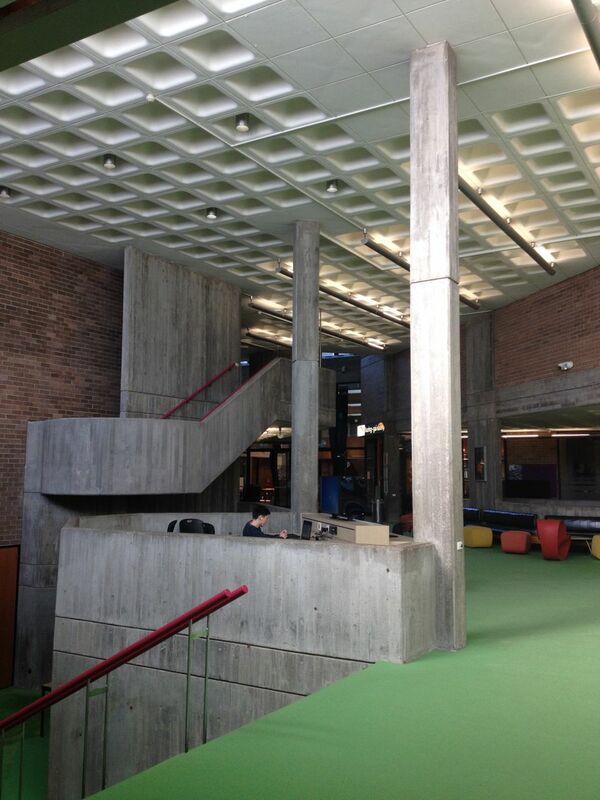 As a architectural style it produced bold, solid designs in concrete. Although the name refers to the French term for raw concrete – béton brut – the “brute” in brutalism is a good description of the assertive effect of the buildings. Among the office blocks of Crows Nest another space ship rests. An inverted concrete pyramid inside wide columns like rocket boosters, the St Leonards Centre looks like it could blast off if given sufficient force. 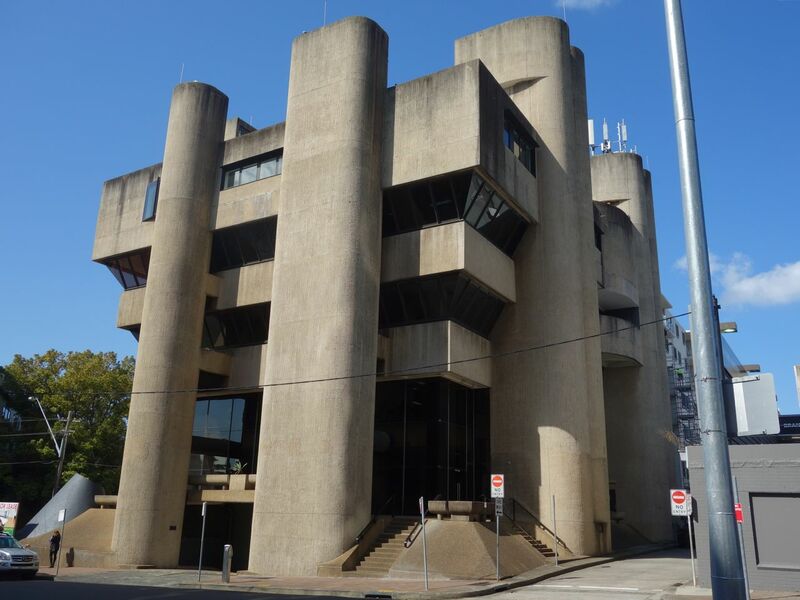 Rather like the Sydney Masonic Centre, its inverted shape gives it a mysterious atmosphere and it’s hard to imagine what exactly might be going on inside. The St Leonards Centre opened in 1972 as the central computing hub for the CBC Bank. Like the Reader’s Digest Building in Surry Hills its computer was a central feature of the building, and employees could enter the viewing platform to watch the Honeywell 6000 in action on Level 8. The building was described as “an architectural first – a sculptured office building” with “one of the most sophisticated computer installations in Australia”. More than 100 CBC bank branches across Sydney were linked to this computer, making it a kind of central banking brain at the core of the space ship. The pamphlet explaining this new technology describes how each branch will be able to “talk” to the computer through their terminals and receive an immediate response. Beam me up! 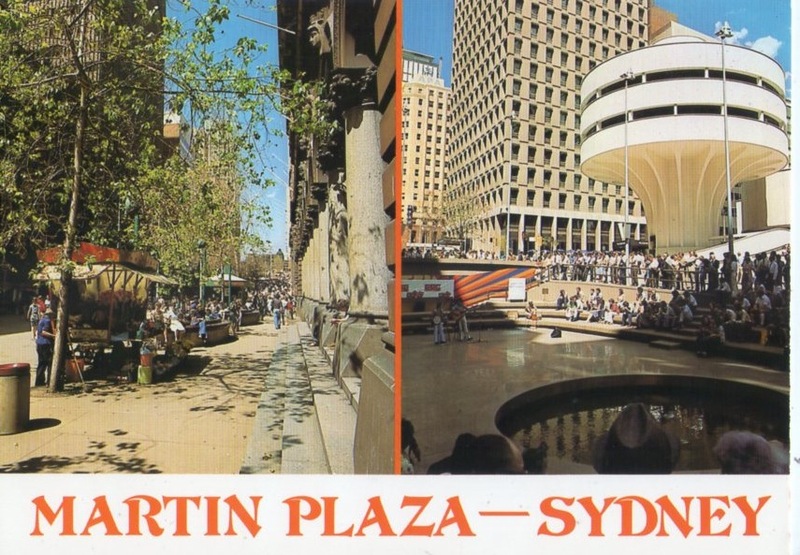 Of all of Sydney’s spaceships the most well known, and most central, is the CTA Building in Martin Place. 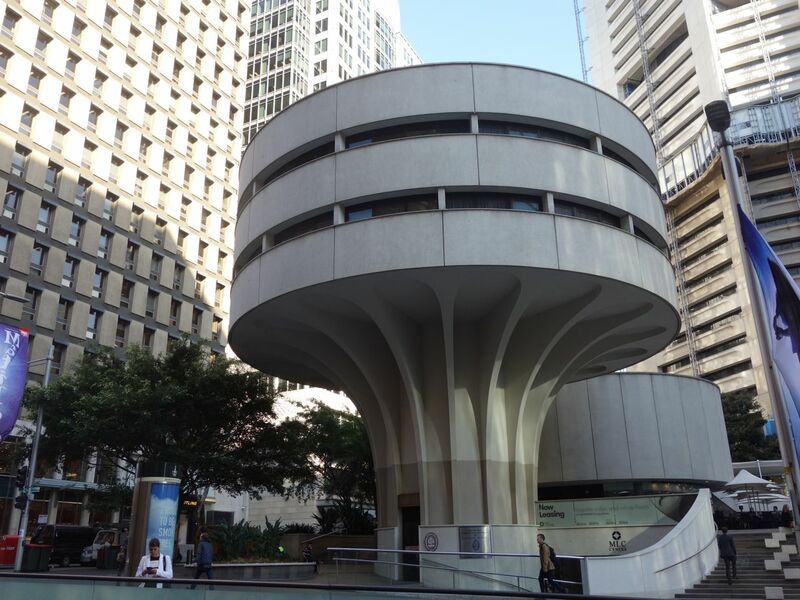 Designed by Harry Seidler in the 1970s, it is so unusual a structure that seems more like a sculpture than building. The thought that it actually had an interior only dawned upon me when I visited it for the Kaldor Art Projects Thomas Demand exhibition in 2012. At the exhibition visitors discovered a series of tiny bedrooms, hotel rooms for commercial travellers passing through Sydney. The slits in the drum are the bedroom’s windows, with a view out across Martin Place. The CTA Building was a part of Seidler’s MLC Centre design, built on a large Castlereagh Street site. Demolished to build the MLC Centre was Hotel Australia, the Theatre Royal, Rowe Street and the previous Commercial Traveller’s Association Club, a tall, sandstone building on the corner of Martin Place. It was replaced by the small, neat building, often described as a mushroom, sometimes lovingly, other time disparagingly. Martin Place, early 1950s. The former CTA building is on the left. Having reached the central space ship I was drawn to the entrance at the base of the curved stem. Inside I entered a metal capsule and was drawn downwards into a dimly lit, red cavern. The floor was patterned with dying stars, so bright they were difficult to focus on. I sat in a curve of dark red velvet and found a tube of cold, sparkling liquid in front of me. I sipped it and underneath my feet felt the rumble of the craft readying for takeoff. Music started: to my surprise it was Pulp’s “Disco 2000”. The extraterrestrials, with their superior knowledge, had known exactly what song would keep me at ease during the ascent.